In the 1880s, British sportsmen developed a working terrier of East Anglia, England. The Norwich Terrier and later the drop-eared variety now know as the Norfolk Terrier, were believed to have been developed by crossing Cairn Terriers, small, short-legged Irish Terrier breeds and the small red terriers used by the Gypsy ratters of Norfolk. They were first called the Cantab Terrier when they became fashionable for students to keep in their rooms at Cambridge University in England. 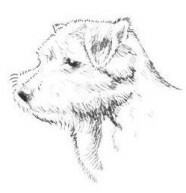 Later, they were called the Trumpington Terrier, after a street in the area where the breed was first developed. Then, just prior to World War I, a Norwich huntsman helped introduce the short-legged terriers to the USA, calling them the Jones Terrier. Norfolks are described as fearless, but should not be aggressive despite being capable of defending themselves if need be. They along with Norwich Terriers and Border Terriers, have the softest temperaments of the Terrier Group. Norfolks work in packs and must get along with other dogs. As companions in the home they love people and children and do make good pets. Their activity level is generally reflective of the pace of their environment. This breed should not be kept or live outside since they thrive on human contact. Generally Norfolks are not given to unnecessary barking or digging but, like any dog, will do either out of boredom when left alone for too long a period. They generally cohabitate well with other household pets when introduced as a puppy. Though, in the outdoors they are natural hunters with a strong prey drive for small vermin. Norfolks are self confident and carry themselves with presence and importance, holding their heads and tails erect. A Norfolk that is shy, or carries its tail between its legs is untypical as is a dog that is hot tempered and aggressive with other dogs; these are not the standard. A Norfolk's typical breed temperament is happy, spirited and self confident. The greatest punishment to a Norfolk is his human companion ignoring him. The Norfolk Terrier has a wire-haired coat which, according to the various national kennel club breed standards, can be "all shades of red, wheaten, black and tan, or grizzle." They are the smallest of the working Terriers. They are active and compact, free moving, with good substance and bone. Good substance means good spring of rib and bone that matches the body such that the dog can be a very agile ratter, the function for which it was bred. Norfolk terriers are moderately proportioned dogs. A too heavy dog would not be agile. A too refined dog would make it a toy breed. Norfolks generally have more reach and drive and a stronger rear angulation, hence cover more ground than their Norwich cousins. Norfolk have good side gait owed to their balanced angulation front and rear, not their perceived slightly longer length of back as is often cited. The ideal height is 10 to 12 inches (25-30 cm) at the withers and weight is about 12 pounds (5 Kg). Norfolks were originally bred as barn dogs to rid the barn of vermin. Some literature suggest that they were also occasionally used on the hunt to bolt animals of equal size from their den. However their short legs do not make them an endurance dog to keep up with a horse. So there is some debate as to their use on a hunt. Norfolks are pack animals and hence expected to get along with other dogs while working or in the home. As a pack dog they take turns working their prey. They are fearless and their courage is incredible. Today of course they are household companions and must have an agreeable disposition for living with people.